Metal. Annihilator. Two words that are quite synonymous to me. But considering that the former of those words is the title of the latter’s new album, there are images and expectations that are immediately raised. Will this record embody the demanding moniker? The latest (let us say the ones after King Of The Kill) Annihilator albums have been so-and-so to me. Great in many ways and mediocre in other. Metal also features a large entourage of cameo-making metal stars that I won’t mention here in great detail. There’s Laiho from COB, Stromblad from In Flames, and many other guys shredding their guts out. You can check the official website for complete credits. The most important thing to know about the guests is that Nevermore’s Jeff Loomis dwarfs everybody else. Period. Said maestro of strings appears on the opening cut, Clown Parade, which kick off with a blistering riff and a nice, double-kick-tempo. Dave Padden is still quite distinct on the microphone and apparently he is also sharing guitar duties for the record. His voice is maybe a bit more harsh then on say, All For You, and it works well with the material. Jeff Waters has the anchor well in control and the rhythmics on the guitar and bass are brilliant. The shredding-duels he has with Loomis are brilliant. The track also gets humorous to me, when the bridge features Maidenesque Wooo-oo-ooou-chanting. It’ll work live, for damn sure. The tune is marvellous with a catchy chorus, so we are off to a good start. Couple Suicide features a peculiar duet with Danko Jones and Angela Gossow of Arch Enemy playing the parts of a failed relationship. The song is a lot more modern-tinged with a formidable groove. The vocal melodies and contrasts of the duo are very grabbing but otherwise the tune is not that great. From here on the overall material goes on the unfortunately familiar path of hit-n’-miss. A frustrating kind of path at that. Because there really isn’t anything wrong at face value with the album. Each song has nice riffage and most of all magnificent guitar solos to back up the metal atmosphere. Mike Mangini – a session wizard known also for work with Steve Vai, among others – provides the beats with a furious speed and lethal accuracy. Army Of One with its “throwback to the old school”-lyrics is very entertaining but…Downright Dominate and Haunted thrash like bulls on speed, but…I can’t fully say what is the matter but my head isn’t spinning as I would expect it to. The final song, Chasing The High closes the record with a mad burst of speed metal and guitar harmonies that are very reminiscent of Alison Hell. That is only a good thing, mind you. The production on this album is slick and balanced. It is odd in a way that in the slower parts it sometimes falls strangely neutered. It’s like the punch from the soundscape disappears for a moment and then comes back again. Overall though, the albums sounds great. If you know the feeling of really hoping and trying to adore some record like all hell, but just can't, that is the exact feeling that I have with Metal. 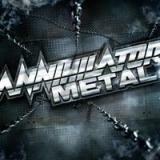 It is very good and technically high quality work, but when we talk about a band as great as Annihilator, just very good doesn’t cut it in my mind. There would be potential for so much more. Nothing has changed radically in the bands direction and the metal is very strong on Metal – technically. I am interested to see how the public takes this album in.